Since I wrote a post at the beginning of the month urging readers to comment and ask questions on Permanent Style, quite a few have asked about different ready-to-wear and made-to-measure brands. I’d like to explain how to compare RTW, and why I can say little about MTM. With a RTW suit, you need to analyse the make, fit and style. Make is fairly straightforward – see my article in How to Spend It on analysing floating canvas, stitching etc. Assessing the cloth is harder, but more important than the ‘quality’ of the cloth are basic things like a decent weight and a non-showy finish. Fit is certainly hard to analyse comprehensively, but I have written about that in detail before – see post here. Most important is to make sure it fits on the shoulders and chest. Then get everything else altered. Style is highly personal, but the key is to start in the middle of the road (single-breasted, mid-width lapels, two vents, flat-front trousers, no turn-ups) and only veer off once you feel comfortable doing so. More detailed things like colour and pattern are dealt with consistently, but in dedicated posts. Have a browse through the Suits category for advice. I don’t browse RTW shops enough to be able to compare Reiss, Austin Reed and Marks & Spencer. But the important thing is to have sufficient information to do so yourselves. MTM is like RTW, but with the added complication of an altered fit. You can analyse the make in the same way as RTW – just have a look at one of their finished suits. Fit, however, is highly volatile. It depends on the system that the company is using to transfer measurements to the factory in Morocco/Hungary/India and – perhaps more importantly – the experience of the salesperson in using that system. It is the same with bespoke – a salesperson with enough experience can largely substitute for a cutter in taking measurements (Simon Cundey at Henry Poole, Brian Lishak at Richard Anderson, both Glasgows at Cleverley). Unfortunately, I have almost no experience with different MTM brands and systems. And as with bespoke, I try to refrain from giving opinions on producers that I haven’t personally tried. When it comes to comparing bespoke tailors, of course, there is no shortage of advice or information, as I had tried 25 around the world at last count. The best place to begin for those comparisons is the ‘Tailors I have known’ posts – there are two, on English tailors and others from around the world. You can follow the discussion on How to compare RTW and MTM suits by entering your email address in the box below. You will then receive an email every time a new comment is added. These will also contain a link to a page where you can stop the alerts, and remove all of your related data from the site. I recently had a bespoke shirt made at Edward Sexton and if fits like a dream, so much so that the comments have been overwhelming. As much as I like the shirt I cannot justify £250 a pop on a shirt and I was wondering if you can recommend a bespoke shirt maker in London who offers a bespoke shirt for around the £150 mark. I know you like Satriano Cinque who charge around £160 but I understand they only come to London once or twice a year. Someone has mentioned Cad and the Dandy but I don’t know anyone who has used them. Do you have any recommendations for a cheaper bespoke shirt maker in London? I’ve used Frank Foster for bespoke, and his shirts were £135 with a minimum of six for the first order. They are made in his shop on Pall Mall, and there is a fitting. However, he may not be taking new orders at the moment, or ever again. You can call and see. They only work afternoons. It’s an incredible price for bespoke, and the shirtings they use are all spectacular. Very interesting feedback from Oliver re Edward Sexton bespoke shirts. They say on the website “Our bespoke shirts have beautifully hand-stitched collars, cuffs and sleeves”. That level of hand stitching is, as I understand it, quite unusual for an English bespoke shirtmaker. Maybe I should pay them a visit. Oliver, if you’re monitoring these comments, do they have a minimum initial order and is the cutter in-house and doing the measurements in person or is it outsourced somewhere? I’ve been considering MTM rather than bespoke for trousers and one thing that my very shallow investigations so far seem to indicate is that there isn’t a huge price difference between my local tailor and someone slightly off-row but still a known name such as Benson & Clegg. I think I’d take quite a lot of comfort in knowing that an experienced cutter was doing the measurements and assessing the fit when the MTM garment was completed. The big name Savile Row houses can be expensive however, even for MTM. I got a quote on Wednesday from Richard Anderson for MTM trousers and that was £700 in Minnis flannel. Simon – you say “MTM is like RTW, but with the added complication of an altered fit.” I suppose it’s obvious which is maybe why you don’t mention it but it is worth remembering one huge difference between RTW and MTM. With RTW you’re stuck with the fabric choices that the buyer/designer made when deciding what suits/trousers/jackets to manufacture to hang on the rail. With MTM you get to choose your cloth and tweak other small details (e.g. pockets and buttons) whereas with RTW you have to take whatever is on the rail. It’s not just about fit and finish. There is no minimum and I know that if you order several shirts they can show flexibility on the £250 price tag. My measurements were done by Dominic Sebag-Montefiore who I believe does all client fittings and is more front of house. It’s a very small set up with a few rooms on the first floor of a townhouse in knightsbridge, if anything it is more of a work shop than a shop. When you arrive you actually walk through the area where the tailors are cutting and stitching so there is a close tie between them and Dominic. Edward himself was also walking around and popped his head in to ask Dominic questions. Hope this helps. Thanks so much for the information Oliver, it was very helpful. Thinking about your (Oliver’s) question regarding more affordable MTM shirts I began to wonder whether any lesser-known bespoke tailors might do bespoke shirts that could be cheaper. One of Simon’s oft-mentioned good value tailors is Graham Browne (suits at about £1K I think vs maybe £4.5K for a big-name Savile Row tailor) so I went and had a look at Graham Browne’s site and lo and behold they do “produce high quality and affordable bespoke shirts with individual patterns to suit all our customers’ needs” (http://www.grahambrowne.co.uk/tailors.html under the “shirts, shoes & accessories” section). Any thoughts on that Simon, or some idea of price? Might this be a solution for Oliver? In relation to this discussion as someone who has a 41inch chest often a 40 inch jacket is a little too snug whilst a 42 inch not as neat. Would you recommend a MTM or a RTW? Would this be overcome by MTM or can it be adjusted on RTW? Lastly, and a point once again affecting the shoulder , would MTM allow high armholes (aka as per Anderson and Sheppered) which facilitate in allowing the collar to stay on the neck , is this something that can be had with RTW brands (if so please let me know which ) or can this only be had with bespoke ? Great article Simon. How much can a good tailor alter a RTW? Specifically thinking sleeve length and other basic alterations. It sounds a little like you would urge someone to buy a RTW and get it altered rather than a MTM. How much would basic alterations cost at, say, Graham Browne? Thanks. Have a read of the post on having a suit altered. Quite a lot, but it won’t change the fundamental shape. Some very good thoughts. I have bought RTW from a wide variety of outlets (Armani to M&S). The key is to find a block or pattern style that generally (for it will never fit as bespoke) fits your body shape. Then spend a little bit on getting sleeves, trousers and waist altered as required for a better fit. The high street move to a tailored fit (read skinny or slim) as a matter of style over practically has resulted in fewer pattern styles that suite the average man. There also seems to be a particular resistance to having sizes outside of 38 – 42 being displyed on the shop floor. The fashion discrimination against size is also being felt in menswear (Kooples is a particular size snob). Generally, however the level of finishing has got better but as retailers seek to monetize their brands (as so many are corporate or equity owned) I have noticed that the quality of fabric has often decreased. Reiss swim against this tide with quality fabrics and excellent finishing. Their tailored fits however leave many men, particularly those of bulkier size, looking elsewhere. To date M&S have probably offered the best price/quality combination though recent offerings have seen some very poor quality cloth. Suit Supply, Chester Barrie MTM, Hugo Boss, Paul Smith, Baumler and Richard James MTM occupy the upper levels of quality. Brands such as Pierre Cardin were also good quality but now much harder to find in the fashion obsessed high street offering. Ted Baker, Reiss, Jigsaw, Massimo Dutti, Charles Tyrwhytt, TM Lewin etc. occupy the mid ground. As for Hackett, Pal Zileri, Armani etc. the relatively high cost vs. fit actually offers poorer value for money than those listed above….I therefore think it would be better to stretch to bespoke if already considering an £800 plus spend. Simon, having touched upon the RTW subject I believe that there is an ineresting story to be told about the large international suit factories in places such as Romania, wherein different brands book time and, from different patterns and cloth, get a multitude of suits made. 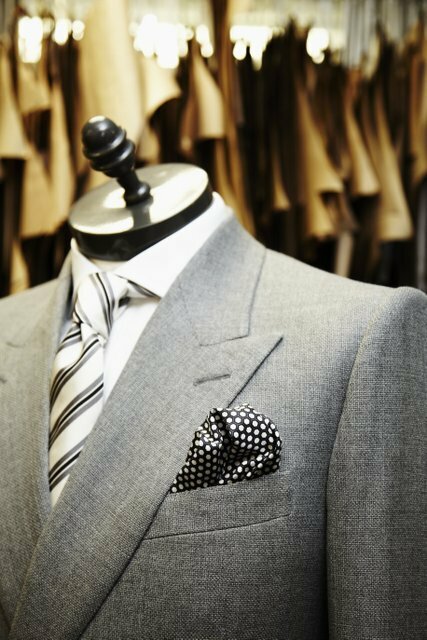 Many of the suits on UK racks therefore emanate from the same factories, including those considered expensive or high fasion. Thanks again for another great article. Who is Kooples and what does size snob mean? Kooples is a French RTW brand. Being a ‘size snob’ is intended to describe the fact that they only stock short, slim clothing that only fits young, thin people, I believe. Great stuff but I notice that your list of English tailors is heavily skewed towards London. Can you recommend a few more tailors offering bespoke or good M2M outside London and the Home Counties? Unfortunately not George. I only recommend tailors I have tried, and I haven’t tried any outside London (excepting Brian Smith at Fox Flannel and Hemingway Tailors out of Leeds), both of which I’d recommend. There are also very few. Count yourself lucky you’re not in the US though. There you have to wait for English tailors to visit even if you live in NY. In fact, only in England and Italy would you have anywhere near the volume of bespoke tailors you have. e that 18,000 combinations. Except for all the handwork, top MTM is virtually bespoke as a totally original pattern is made. Let’s do a test. I’ll send you to a friend who makes my MTM. He will make you a suit. We will do side-by-side photo of you in the MTM and a bespoke and ask the readers to guess which was bespoke. Both suits will be new and never seen before by your readers. You up for the challenge? Bob I must agree with you. I find it disappointing when people belittle made to measure. My father and I have had many suits made bespoke , and were talking Caraceni and others not some small time tailors. We have also had many suits made made to measure. You are right, the differences are quite small. For those of us that can feel the difference of a few mm’s here or there, yes bespoke is the dream, but to say that bespoke is head and shoulders above is wrong in my opinion. I have suits m2m that look as good if not better at times than bespoke. To be honest it has a lot to do like Simon says with the skill of the person measuring. I have a friend who has started m2m in London who is brilliant and I think a suit from him is a better option than bespoke for daily requirements. I just cannot justify the extra £2/3k on a garment considering I know in many cases how and where they are made. Especially in this economic climate. Simon please please if you have the time take some time to visit some m2m people I think it would be beneficial to some of your readers as well as a stepping stone before moving up to bespoke. I guess Bob the same arguement could be made for bespoke vs semi-bespoke shoes or shirts.. Thanks Michael. The biggest issue, as you say, is the difference that the process around measuring – even the individual salesman involved – can make. Then there’s the different factories that different people use, who all have different processes and levels of manipulation of the pattern. And finally, these MTM brands come and go fairly frequently, and even change process/factory without informing the customer. For all these reasons, bespoke is more consistent. And it can start at £1k (Graham Browne) and you get top quality for £2.5k (Kent Haste Lachter). I completely agree though, a thorough review of the fitting of such MTM brands would be extremely valuable. Right again. That’s another problem. I guess it’s hard to find many brands with decent integrity these days! There are a couple in the city who are decent and a couple who are based in the west end. Unfortunately this ‘bespoke’ issue still remains which is unfortunate. I was told last week by so called connoiseeur that Dress to Kill suits are handmade in England for £400 which made me chuckle. There needs to be better transparency for consumers. I hope your mtm journey fares well. I would also say, the dynamics for shirts and shoes are very different. Both make a lot less difference to fit when bespoke. Particularly shirts. Far more argument to go for MTM with shirts, if done well. And for quality RTW shoes, if you can find a last that works for you. I am more and more interested to buy MTM garments. For the shirts, the reason is simple…I went to gym and now the RTW shirts usually have creases around the top 3 buttons whilst the fit and collar are fine. For the suits or trousers and jackets, it is more about the fabric choices. I wanted to know if you have visited Volpe in London and what do you think about their work? Also, what tailor or shop would you recommend in London for Italian MTM with light construction and soft shoulder. Ideally Neapolitan style. I’m afraid there is no Neapolitan MTM in London except at Kiton, which is very expensive. I don’t know Volpe enough to recommend them I’m afraid. I was wondering a bit more about the MTM point here. It feels like you are talking about MTM from the big brands rather than from bespoke tailors? Does the same issue apply to MTM at bespoke tailors. I can essentially afford to go MTM at higher end tailors or bespoke at the bottom end. There are certain styles that appeal to me and they are only available (to my knowledge) at the higher end, so I end up looking at a trade off between a bit of fit for the house style I like.